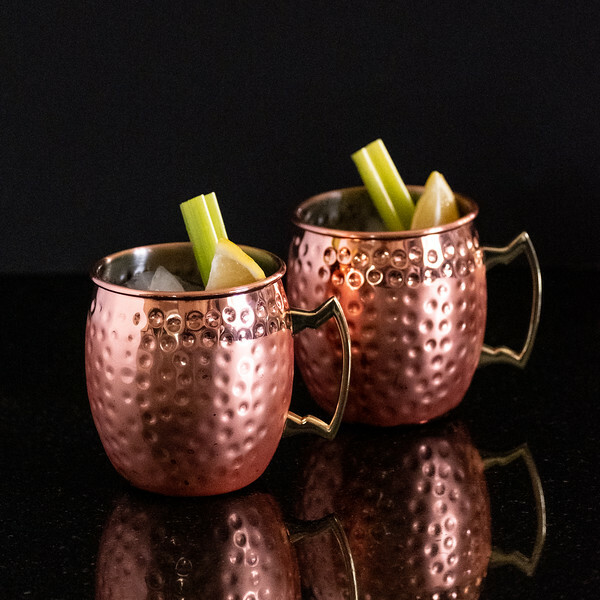 This Spicy Moscow Mule has a delicious kick from the celery black pepper vodka! So easy, you don’t even need a cocktail shaker! Pepper vodka, ginger beer, celery stick and a lemon wedge are all you need for this oh-so sippable cocktail! A Moscow Mule is a very simple cocktail using vodka, ginger beer and lime juice. The story goes that in the 1930’s John Martin had purchased Smirnoff Vodka and was complaining to Jack Morgan that he couldn’t sell his vodka. Jack Morgan was also having trouble selling his ginger beer. A third person, not named in the story, said that she was having trouble selling her copper mugs. Martin combined his vodka with Morgan’s ginger beer, added a little lime juice and served it in the copper mugs. It became a hugely popular drink in the 1950’s and 1960’s. With today’s growing popularity of cocktails, variations of the Moscow Mule are showing up every where! 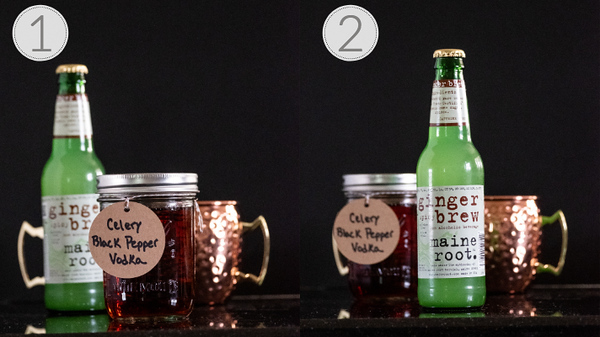 Steps 1 and 2 – Fill a copper mug with ice and gather your ingredients: black pepper vodka and your favorite ginger beer. Steps 3 and 4 – Add 1 1/2 ounces of pepper vodka to mug. Top with ginger beer. 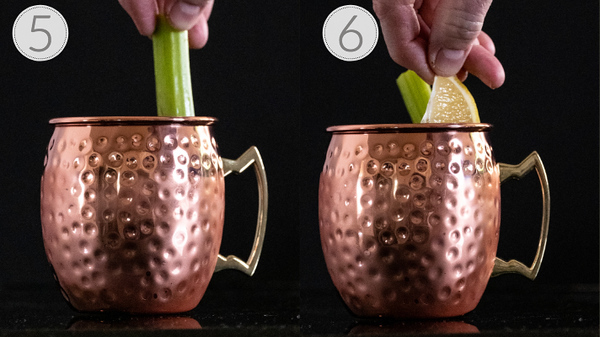 Steps 5 and 6 – Garnish with celery stick and a lemon wedge. A copper mug isn’t a necessity, but the copper transfers the cold of the drink to the mug and it feels cooler. You can use purchased Black Pepper Vodka, but my Celery Black Pepper Vodka only takes 3-5 days to make and is delicious! Ginger Beer or Ginger Brew will work for this recipe, but do not use Ginger Ale, it doesn’t have enough flavor. Don’t skip the garnish, they not only add flavor to the cocktail, but the aroma increases your enjoyment. This Spicy Moscow Mule is delicious! Ginger beer has a natural kick of heat from the ginger and when you pair that with black pepper, it’s amazing. This is refreshing and so easy, you’ll definitely want to add it to your cocktail rotation. Let me know if you try this Spicy Moscow Mule! Bourbon and Ginger Beer combine perfectly in this Orange Ginger Fizz. This Blackberry Ginger Fizz is not only gorgeous, it’s delicious! Dark rum and ginger beer make a Classic Dark and Stormy. 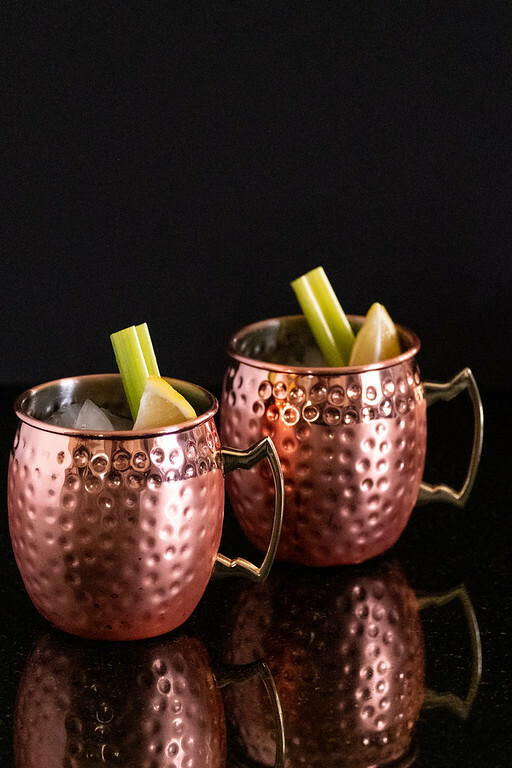 With a kick from the ginger and black pepper vodka, this Spicy Moscow Mule is a fun and delicious cocktail! Pour pepper vodka over ice. Garnish with celery stick and lemon wedge. 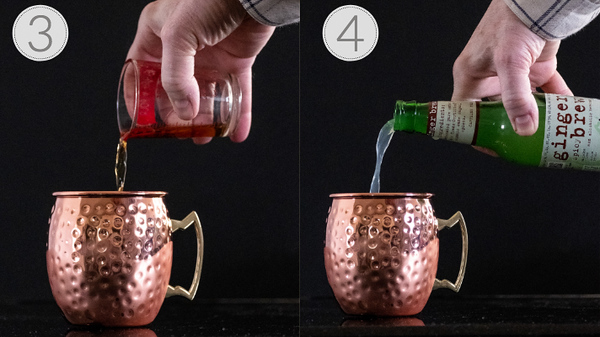 Copper mugs are optional, but add a fun touch and make the drink feel colder. Use homemade Celery Black Pepper vodka or purchased Pepper Vodka. Use Ginger Beer or Ginger Brew, not Ginger Ale. The celery and lemon wedge garnish really does add flavor to the cocktail. What an easy and interesting combination of ingredients for a cocktail. Love the copper mugs too! Great way to present this special combo drink in this special Copper Mug. Love this presentation. That is a great story on how this drink came to be. I see these copper mugs a lot. Sounds like my kind of cocktail – super refreshing, and those ingredients sound like the perfect pairing! Also anything with ginger beer automatically gets my vote! This drink recipe sounds amazing! I love using these cups for drinks also!